Well, I’m ten weeks in now. Just to remind you all, I started the ketogenic diet at 15 stone, 10 pounds. My goal is 12 and a half stone, by mid-March 2015. This means a target weight-loss of 2lb per week. Week Ten’s target-weight therefore? 14 stone, 4 pounds. Waistline measurement only once a month, so not this week. 14 stone, 9 pounds. Another pound off! The downward trend is sure and steady; this week’s reading presents a 1lb weight-loss from last week. The ‘1lb pattern’ seems to have settled into a routine for the last three weeks, so I’m pleased that there’s some sort of regularity to the whole thing. I’m now 5lb behind target, but I’ve very much accepted that speed is not an issue. As long as I’m losing weight, that’s all that counts. I’m now 1 stone & 1 pound lighter than I was ten weeks ago, which is a brilliant feeling and worth celebrating! A lot of people have said to me that the body can only tolerate a 1-2 lb weight-loss per week. These figures would support that statement, which is positive. The ketostix are still showing a dark purple a lot of the time, so I can be sure that the weight-loss is body-fat; not just water! 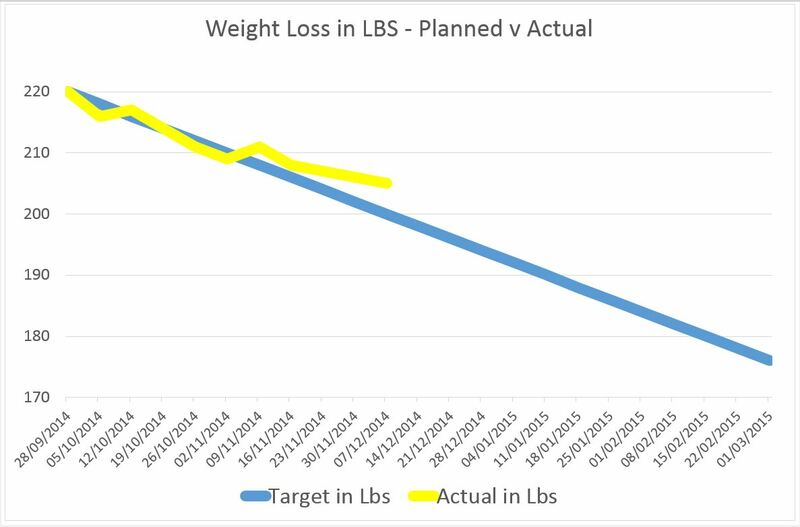 This week, I’ve plotted my weigh-in results into a graph (shown above). Although I have divergence from the plan, the trend very much shows that everything is going in the right direction. If I can keep the 1lb weekly reduction in place, then I’ll be at 13.5 stone (approximately) by mid-March’s end date, which will still be a brilliant outcome. At that point, I’ll see how I feel and take things from there. If it takes a further 4-6 months to reach my target, then that’s no skin off my nose. What will I do when I get there anyway… start eating huge quantities of carbs again??? Hardly! The weigh-ins are simply a means of tracking progress; without this it would be difficult to assess how things were going. In short, I am pleased! 1. Weight-loss is erratic and hard to quantify. There’s no one thing I’ve done any differently at any point; the body seems comfortable to go at its own pace – so who am I to argue…? As one kind reader kindly pointed out to me (Janet) – my body doesn’t know it’s ‘weigh-in Sunday’; the measurement is something I have imposed, not visa versa! Learning one therefore – your body goes at its own pace. Let it! 2. Plateaus are completely normal. The body seems to waiver around a certain weight for a while, before it kick starts into losing a bit more. Ways to get around these plateaus? Short keto-fasts are one method. My body doesn’t seem to respond in any way to quantity (i.e. if I eat more one day, less another; progress isn’t affected), but missing a meal for whatever reason really kick starts ketone production. Insisting that I eat something at certain times seems an entirely pointless exercise! One of the great things about a keto-diet, is that hunger is reduced. I see no need to eat when I’m not hungry; that is probably one of the practices which led to weight-gain in the first place! Learning two therefore – listen to your body! Eat when you want to; not when the clock tells you to. If your body needs food, it will let you know. 3. Food restriction and portion-control are completely unnecessary on the keto-plan. As long as you stick to the varied and delicious foodstuffs which are low in carb, you can pretty much eat what you want! To illustrate this, December thus far has been dedicated to ‘Christmas food’. In the last week, I’ve eaten chocolate roulade, gin and tonic jellies, huge roast dinners, hollandaise sauce and a whole host of other high-calorie meals. Despite this, weight-loss is continuing at a pleasing rate. Learning three therefore – stick to the low-carb food-list and you can eat whatever you like! This includes puddings and alcohol too. Enjoy your food and don’t fight it – this is not a punishment! In summary, I’m feeling incredibly motivated and LOVING the visual & physical benefits of losing weight. People keep noticing I’m looking slimmer, which leaves me flushed with pride! I’m feeling great and am fitting back into clothes I haven’t worn for a long time. I’ve also gone down a belt size – the stomach no longer hangs over the trousers!! This is my new favourite thing! My one big challenge will be an impending holiday. We’re off to Germany next week to visit the Christmas Markets. From the 13th Dec, the state of ketosis moves to foreign climes! Posts may be a little sporadic and less frequent I’m afraid. Next week’s weigh-in also depends on whether or not the apartment has weighing scales in the bathroom! So watch this space. Germany is the land of beer & carb-laden foods, so I anticipate I may waiver a little and partake in some mulled-wine and wonderful German beer! Life is there to be enjoyed however, so I’m not going to beat myself up about it, if things digress for a week or so. Please do ‘look in’ on me next week (scales depending) to see if I make further progress towards my targets. I find it really positive to have people read this – the support is a massive encouragement!